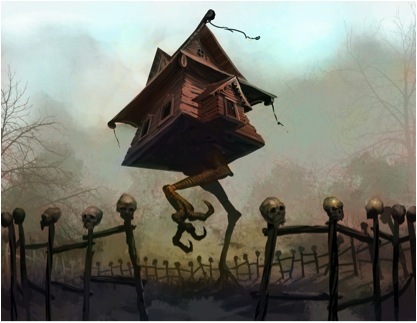 This picture of Baba Yaga’s house is by Thomas Denmark, a graphic artist with a talent for fantastical imagery. For anyone not familiar with Baba Yaga, she is the hag-witch who features in many Russian wonder tales. Her house lies deep in the forest; it stands on chicken legs so it can turn around to see anyone who approaches; the fence is made of human skulls that glow in the dark. Her magic is not for everyone but if she is met with compassion rather than dismissal; with courage rather than timidity; with an open mind rather than disbelief, then she is willing to help. And her help can make the difference between life and death (or between a fulfilled life and a living death). Maybe we should adopt her as the patron saint of all those who work outside organisations in order to bring transformative experiences to those who work within them. Afterwards, we coaches/facilitators/ritual-holders spoke about our experience of the event and wondered aloud how to make the case for this kind of work more widely in corporate settings. We asked if it was possible to legitimate it by conventional research methodologies and thereby bring it more into the mainstream of leadership development. At face value this is quite an attractive idea. I would certainly like to do more of this kind of work and be well paid for doing so. And yet… and yet I question how far we should go in this direction. Intellectually, I know that research finds it difficult (usually impossible) to cross epistemological divides. Are there quantitative measures of the soul’s journey? Can purpose be weighed and measured? Can compassion and self-esteem be counted? Practically, I know that the ability to do this work well has required a long sojourn ‘deep in the forest’ outside of conventional organisational life and I suspect that a substantial cause of its efficacy is the very difference we bring. Baba Yaga (and practically every other witch, mage, and shaman in history and in story) lived outside the village for just this reason. Her magic – and our magic – works because people leave behind what is familiar and come onto ‘faery ground’ where different logics and different rules apply. So let us not be too hasty to package neatly what we do to fit corporate expectations and corporate language. What we need (and this role should be valued much more highly than it generally is) are go-betweens: mediators who have access to both worlds. They can draw on their reputation and credibility in the corporate world to build relationships of trust with client organisations. They also know the forest and the world of modern day Baba Yagas. They are the unsung heroes of this work, the guides to the liminal space between everyday experience and transformative practice. Because of them, Baba Yaga (and all who follow in her footsteps) can stay in the forest where their power lies and do good work with the folk who come to visit. I just tripped across this in a burgeoning mailbox today – thanks Geoff. Very timely thoughtful posting as I try to box up in a research report the impact of stories that have been told. And also as I ask myself who I am in the work I do. I’m no Baba Yaga I recognise but I do like to visit and spend lots of time with her – and then ply back into the otherworld. Am soon to be 60 and would love nothing more than to go and live in a hut on chicken legs in a wood. Does anyone know of one going cheaply?